When I drop some cash on my hair color, I want it to LAST! There’s nothing sadder than seeing that expensive color going down the drain. 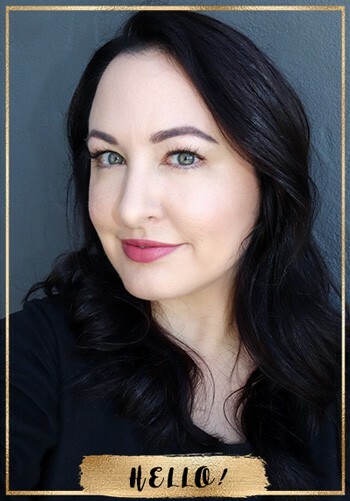 That’s why I was excited to try the new (ish) Color Care Line from one of my favorite vegan and cruelty free hair care brands – DermOrganic. The line has three products – a sulfate-free shampoo, conditioner and thermal spray. Just like the DermOrganic I know and love, they are all made with natural ingredients, including one of my hair’s favorite ingredients: argan oil. The products are made with 70% or higher organic ingredients, and they are low pH. The products are also made without sulfates, salt, sodium chloride, artificial preservatives, parabens, PABA, propylene glycol, petroleum, MEA, DEA, colors or dyes. The main difference between this line and the classic (green label) DermOrganic line, is the addition of UV-protectants like Vitamin A, Vitamin E, sunflower and grapeseed extract. Thee help to keep your color from fading. The other thing you will notice is the scent. It’s got a cherry scent, that I’m not a huge fan of, but it’s not overpowering and it fades quickly. I’ve heard other bloggers rave about it, but it’s just not my favorite scent! The shampoo and conditioner make my hair soft and smooth without frizz and flyaways. They don’t weigh it down at all. In fact, my wavy hair loves it – the ends curl up nicely. The 8 Way Thermal Spray helps prevent frizz, protects hair from the elements (sun, chlorine, wind, etc.) and it protects my fine hair from heat styling. I love it because all the other heat protectants I have tried feel heavy and coat my hair, but this one feels light as air. I also love that the first ingredient is aloe – which means there is a high percentage of moisturizing aloe (along with EFA lipids and rice amino acids). It does contain dimethicone – which I really like. But if you’re avoiding dimethicone, you may want to stick with the shampoo and conditioner (which are cone-free). 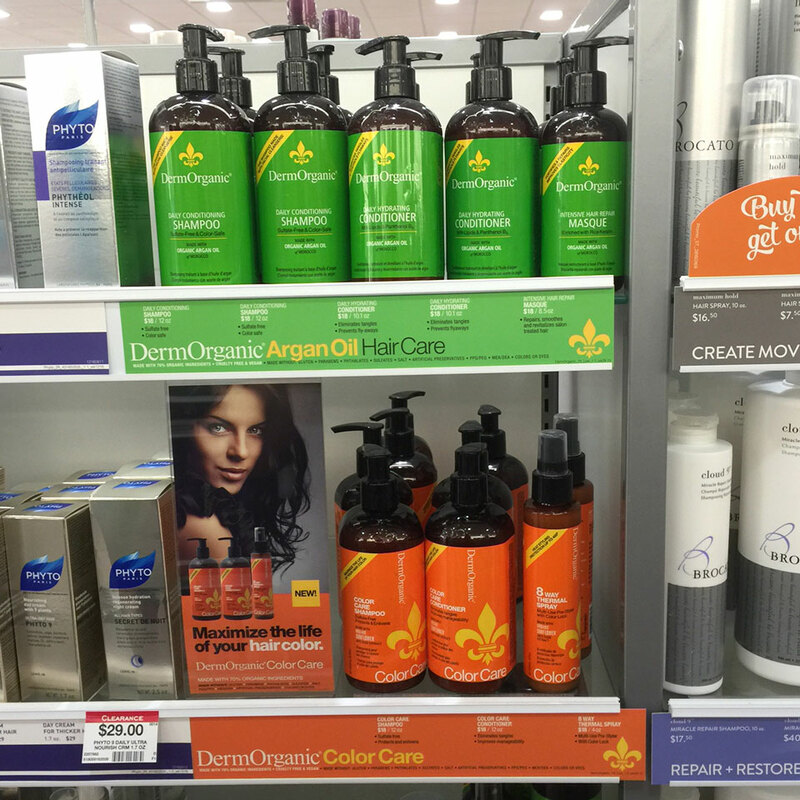 You can find DermOrganic products at Ulta stores across the US – I went recently and checked out the goods! 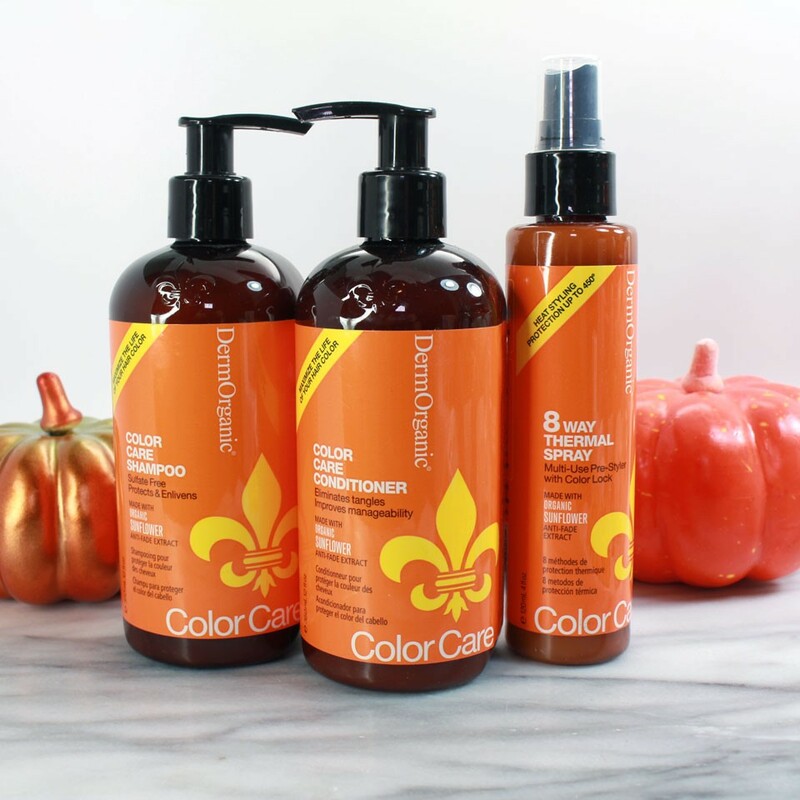 Want to win all three DermOrganic Color Care products? I’m giving away the Sulfate Free Shampoo, Color Care Conditioner and 8-Way Thermal Spray to one lucky My Beauty Bunny reader. Just enter via the Rafflecopter widget below. You must be 18 or older – US only. By entering, you agree to the official rules. Ends 10/24 at 12 am PT. Good luck! « Lipstick League – What Nail Polish Are You Wearing? I would love to try them because they are vegan and natural. I would love to try this line! I use demi-permanent dies and they fade fast. I have a gentle shampoo and conditioner but I’ve been looking for a change. I definitely need to try this. I am venturing into a new hair adventure this week. I have been wanting to color my hair purple forever. But i will have to bleach it. I know this.is going to be hard on my already frizzy hair. Very excited about these products! Would love to win because they are sulfate free and my hair needs all the natural help it can get! Thank you!! I’ve had a really difficult time finding haircare products that don’t quickly fade my hair color, so I’d love to try this. I would like to try DermOrganic to help save my precious color! I save to splurge a little on hair color only to literally watch it wash down the drain. That is so frustrating! I’d give anything to get my gorgeous hair color to stay just a little longer! Being huge fan of cruelty-free products, it is a challenge to find products which will benefit the needs of my hair as well as are responsibly made! As a vegan, I try to support as my cruelty-free, vegan products as I can. I am really glad to see more & more available on the market! From what I’ve read about this p does not weigh hair down which is a HUGE plus for me as I have waist-length hair. Finding a cruelty-free product which doesn’t weigh my hair down is a huge challenge! I would like to try this line for the UV protection properties it has to help keep my color from fading. I am not using a uv protecting product currently however I need to be since it helps color last. I’ve been a Loyal DermOrganic Custumer for two years now and I’m super excited to try their new color treated hair line! I’ve been waiting for this! I’ve used the green range for years and it’s so good for my colour treated hair PLUS its vegan so I’d love to see what the orange range can do. Would love to try I like that it’s made mostly organic and the added vitimins and extract to help keep the color in you hair! Be thrilled to win these and put them to the test! Ive heard alot about the product line, I like that they are all natural and vegan! I would love to use hair care that help maintain my color, and is good for my hair. 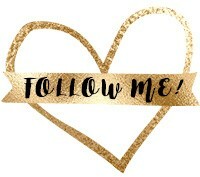 I would love to find great haircare for highlighted hair that is vegan and cruelty free. Sounds like DermOrganic has hit the trifecta! I would love to try the DermOrganic Color Care line because my colored hair always looks dull after a week or two of washing. I’ve been dyeing my hair red for years, and am always looking for a great haircare line to protect and extend my color! I color my hair and I have dry hair. I am looking for a product that will help undue the damage of the color. I would love to try this haircare line because I color my hair and love natural products. I would like to try it because I love trying new beauty products…especially hair care items! Plus it is organic and full of amazing ingredients. I would love to try these products, because I always color my hair and have never tried these products! I want to try the Derm Organic line because I am being aware of what I use on my hair and skin and what I put in my body. 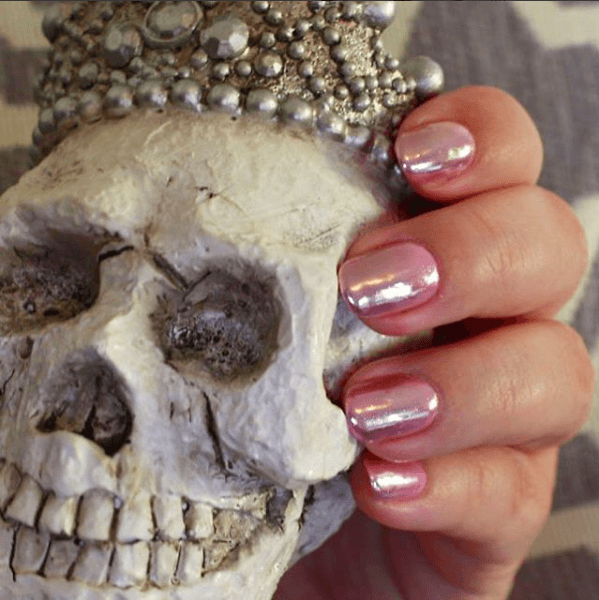 Lipstick League – What Nail Polish Are You Wearing?